The new TroopWebHost User Forum allows you to exchange ideas with other TroopWebHost users around the world! The Order of the Arrow Roster Report contains contact information for all current OA members. The User Activity Report lets you identify members of your troop, crew or pack who are not using your site sufficiently. Troop 342 of Eden Prairie, Minnesota! 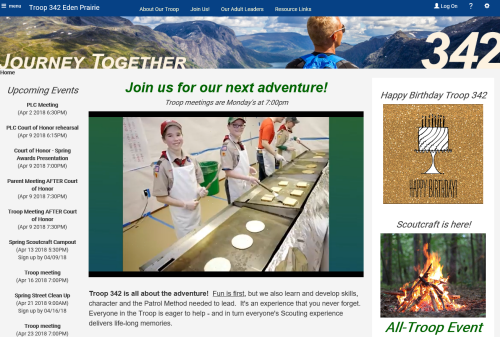 The banner image speaks to the adventures that lie ahead for prospective scouts. The home page features three excellent videos, the first of which plays automatically (without sound!) when you enter the site. We loved how they used widgets on several custom pages to create dynamic content and created lots of Resource Links.